Climate hawks began to shift their focus yesterday from a defeated carbon fee referendum in Washington state to boosting renewables in states where Democrats wrested control of legislatures and governors' mansions from Republicans. Heading into Tuesday's midterms, greens had hoped a win in Washington, where a ballot initiative asked voters to approve a fee on carbon emissions, would propel a series of state carbon-pricing plans nationwide. But with the carbon fee headed for a resounding defeat, environmentalists said they would pursue smaller policy initiatives to boost renewable energy, spur adoption of electric vehicles and revamp building codes. "I think the top-line story in the West is there is significantly more opportunity, and even a mandate, to move on clean energy and climate than before the election," said Noah Long, who oversees the Natural Resources Defense Council's energy and climate program in the Rockies and Pacific Northwest. Some of the Democrats' biggest wins came west of the Rockies. The party seized control of all three branches of state government in Colorado, New Mexico and Nevada; padded its legislative majorities in Washington; and returned a climate champion to the governor's office in Oregon, where Gov. Kate Brown (D) easily prevailed in what had once appeared a closer-than-expected contest. Democrats also picked up gubernatorial seats in Illinois, Kansas, Maine, Michigan and Wisconsin. In New York, Democrats took control of the state Senate, giving the party control of all three chambers in Albany. Boosting renewable energy production was a campaign staple across those states. Democratic gubernatorial victors in Colorado, Maine and Illinois campaigned on 100 percent renewable pledges, while the winners in Nevada and New Mexico voiced support for 50 percent renewable portfolio standards by 2030. "That is huge. If these states come together, they're going to have very pro-climate policy," said Joe Nyangon, an energy researcher at the University of Delaware's Center for Energy and Environmental Policy. The impact could be considerable, he said, especially if the new Democratic governors commit their states to the 26 percent reduction in greenhouse gas emissions sought by the Paris climate accord. The seven states where Democrats picked up governorships account for more than 12 percent of U.S. greenhouse gas emissions, Nyangon said. But even as environmentalists plotted to green their states, they faced questions about whether their efforts would be enough. Economists have long pushed carbon prices as the most effective means of achieving emissions reductions because they provide a powerful incentive for consumers across all sectors of the economy to choose cleaner alternatives. Renewable portfolio standards, by contrast, deliver carbon reductions in the power sector, an area where states have already had success. Transportation emissions, meanwhile, are slowly increasing and are the largest source of greenhouse gases nationally. Emissions associated with residential heating and cooling have also stymied would-be carbon cutters. Constantine Samaras, an associate professor of civil and environmental engineering at Carnegie Mellon University, predicted states would increasingly implement tax incentives to deploy electric vehicles. Cities are likely to explore more stringent building codes. And cities and states are likely to continue to push for emissions reductions from their operations, providing a road map of sorts for wider societal carbon cuts. "These are all great and important climate policies, but still are nibbling at the edge of a giant problem," he said. That doesn't mean carbon pricing is the silver bullet, Samaras said. A carbon price won't work if it's not politically acceptable. "Economists are not wrong to push for a carbon price. But the reality of the carbon emissions reductions we have to achieve by midcentury and our political economy is there needs to be a multi-policy approach to achieve the emission reductions that are necessary," Samaras said. Washington's failure to pass a carbon fee represented the third time in three years the state has failed to put a price on carbon. A legislative effort championed by Gov. Jay Inslee (D) and a 2016 ballot initiative each failed prior to Tuesday's vote. But that doesn't mean Washington's efforts are a complete failure, said Anne Kelly, a senior policy director at Ceres, a nonprofit that works with businesses to green the economy. Washington greens succeeded in building a coalition that included businesses like Microsoft Corp. and labor and minority groups. "They helped to normalize the notion of a carbon fee more than anyone else has done at the state level," Kelly said. Nor is carbon pricing at the state level dead. The Massachusetts Senate unanimously passed a carbon fee earlier this year, and greens there have pledged to revive the idea in 2019. In Oregon, Brown has pledged to sign a cap-and-trade bill and make her state the first to link with California's emissions reduction program. Still, state-level environmentalists were already starting to cast their gaze elsewhere in the wake of Tuesday's results. They acknowledged the limitations of pursuing policies like renewable portfolio standards but pledged to forge ahead, saying that such measures are politically viable avenues to significant carbon reductions. In Nevada, where Democrat Steve Sisolak bested Republican Adam Laxalt in the gubernatorial contest, environmentalists were already talking of sponsoring a bill to complement a ballot question calling for renewables to constitute half of the state's electricity sales by 2030. The ballot question passed Tuesday with nearly 60 percent of voters in favor, but because it calls for enshrining the mandate in the state's constitution, it will need to be approved by voters a second time to go into effect in 2020. Sisolak was a vocal supporter of the proposal on the campaign trail, and his victory removes one of the last impediments to boosting the state's renewable portfolio standard (RPS). Gov. Brian Sandoval, a Republican, last year vetoed a bill to increase the state's RPS from 25 percent in 2025 to 40 percent in 2030. Supporters of the ballot question made clear they welcomed a legislative solution. "We believe no one in this state should wait for more clean, cheap energy," said Kyle Roerink, a spokesman for the Yes on Question 6 campaign. "We support all efforts to increase our current standard." Renewables were at the forefront of the gubernatorial campaign in Colorado, where Rep. Jared Polis (D) rode to a resounding victory over Republican state Treasurer Walter Stapleton. Polis, who kicked off his campaign at a coffee shop that uses solar power to roast its beans in the southern Colorado community of Pueblo, made a 100 percent renewable pledge central to his campaign. 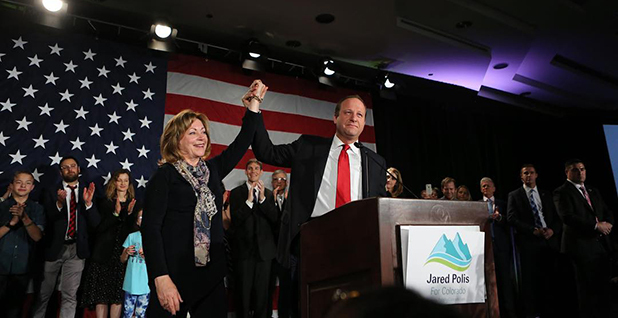 Polis' victory was complemented with wins by five female Democratic state Senate candidates, giving Democrats a two-seat majority in a chamber where Republicans had boasted a one-seat advantage. All those candidates have strong environmental credentials and helped offset any disappointment that greens might have felt at the defeat of Proposition 112, which sought to boost the minimum setback distance between oil and gas drilling rigs and dwellings. "The way I interpret what happened yesterday is Coloradans expressed clearly they want action on climate and clean energy," said Erin Overturf, deputy director of Western Resource Advocates' Clean Energy Program. "There is definitely a hunger among people in this state to act boldly. I think we will have new opportunity to do that in the coming years." It was a similar story in New Mexico's gubernatorial race, where Rep. Michelle Lujan Grisham (D) won by 14 points over Republican Rep. Steve Pearce. She campaigned on a promise to push the state's RPS to 50 percent by 2030 and to mitigate methane emissions from New Mexico's prolific oil and gas fields. Her victory means Democrats will take over the governorship from Susana Martinez, a Republican who is close to the oil and gas industry. And just like in Colorado, Democrats added to their majorities in the Legislature, where clean energy advocates picked up seats. "I think there is a new day in New Mexico," said NRDC's Long. "I am a very hopeful that New Mexico will rise quickly from the very back of clean energy to the very top in the next months." In Illinois, Democrat J.B. Pritzker soundly beat Gov. Bruce Rauner (R). The victory was particularly significant because it gives Democrats control of all three branches of government in one of America's largest coal-burning states. Pritzker campaigned on a 100 percent renewable pledge, though he offered few details of how he planned to meet that target. His win means the Illinois Pollution Control Board is unlikely to act on a Rauner proposal to weaken Illinois' air quality rules governing coal plants. The board had rejected Rauner's plan but then put forward a compromise solution of its own. "Governor-elect Pritzker will have opportunity to sit down with his new EPA director and say, 'Let's take another hard look at this and not simply do what was done before," said Howard Learner, founder, president and executive director of the Environmental Law & Policy Center. Jack Darin, executive director of the Sierra Club's Illinois chapter, said Pritzker's policies should build on the state's clean energy efforts to date, including the passage in 2016 of the Future Energy Jobs Act, a law supported by the Rauner administration. "Pritzker understands the tremendous promise the clean energy economy holds for all of Illinois, but particularly communities burdened by poverty and pollution, and those needing to make the transition from fossil fuels to clean energy," Darin said in a statement. Climate gains were not limited to Democratic victories. In Massachusetts, Republican Gov. Charlie Baker cruised to re-election. His victory was punctuated by his endorsement of a regional cap-and-trade program for the transportation sector in his last debate with Democratic challenger Jay Gonzalez. His comments were widely seen among greens as a boost for the Transportation and Climate Initiative (TCI), a group of Northeastern states seeking to curb greenhouse gas emissions from the transportation sector. The Massachusetts governor has been joined in that effort by Govs. Larry Hogan and Phil Scott, Republicans who won second terms in Maryland and Vermont, respectively, said Vicki Arroyo, executive director of the Georgetown Climate Center, which is facilitating the initiative. All three have been supportive of TCI and of regional efforts to oppose President Trump's rollback of environmental rules, she said. While Democratic wins elsewhere may ease the way for climate policy, it is important to note where Republicans are also contributing, Arroyo said. "Some of these states have been as engaged as any," she said.